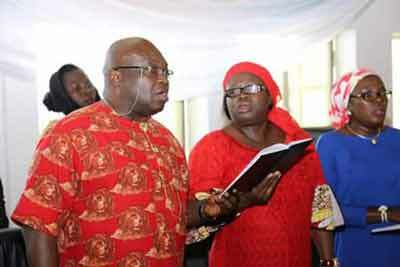 The Executive Governor of Abia state, His Excellency, Dr. Okezie Ikpeazu and his wife, Mrs Nkechi Ikpeazu, were recently joined by other members of the state executive council and other aides, for a special thanksgiving service, held in his honour at the state government house chapel, to mark his 52nd birthday. Dr Okezie Ikpeazu the 9th Governor of Abia state assumed office on the 29th of May, 2015. Before his emergence, to office as the Executive Governor of Abia state, Dr Okezie Ikpeazu as served his community at various capacity and levels, making him a thorough grassroots personality, best suitable for the job. Some of his past duties are, Chairman, Obingwa Local Government Area, Abia state, 2002 – 2003, General Manager, Abia state Passenger Integrated Manifest Scheme (ASPIMS), 2007 – 2009. Chairman Governing Council, Abia state College of Health Technology Aba, June 2010 – March 2011. General Manager, Abia state Passenger Integrated Manifest Scheme (ASPIMS), May 2011 – May 5, 2013. 1st Deputy General Manager, Abia state Environmental Protection Agency, Abia state, May 5, 2013 – October 10, 2014. Dr Okezie Ikpeazu succeeded former Governor, Theodore Orji, becoming the 9th Executive Governor, of Abia state on the 29th of May, 2015.